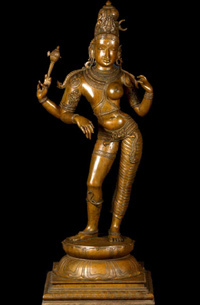 Turn your altar into a truly divine place by inviting one of our bronze murtis into your home and into your soul. Bronze Creative is Divinity in Bronze! Pancha Mukha Ganapati, 5 Headed Ganesh Statue on 24"
Bronze Sculpture of Mother Devi with Children 24"
Bronze Shiva as Bhikshatana with Dog 14"
Chariot with 7 Horses 31.5"
Puja Ganesh Statue, Ganesh Worshiping Shiva Lingam 15.5"
Shiva Shakti Statue, Androgynous Form of Shiva 42"
8 Arms & Lion 19"
Nataraja Ganesh Statue Dancing on Rat 30"
Halebidu Krishna Statue with Peacocks, Cows & Yalis 38"
Nandi with 10 Attendents 37.5"
Bronze Narasimha Statue Killing the Demon Hiranyaksha 37"
Statue, Shiva, Parvati & Murugan 24"
Polished Bronze Somaskanda Statue with Arch 18"
Krishna & Arjuna on Chariot with 8 Horses 60"